An associate degree in business can prepare students for a wide range of jobs. The variety of potential careers are made possible by a degree curriculum that covers a wide range of business topics, including business writing, accounting, marketing, management and business law. With a broad level of training, students can enter jobs such as that of real estate agent, accounting clerk, insurance agent and business manager. Workers in these areas enjoy room for career advancement and salary growth. This guide offers all the details to earning an online associate degree in business to get you started. Prospective students interested in getting an online associate degree in business have plenty of programs to choose from. However, deciding which one is the best can be difficult. The following list ranks the best online associate degree programs based on metrics that matter most for business majors, such as student-to-faculty ratio, cost of attendance and availability of career services. 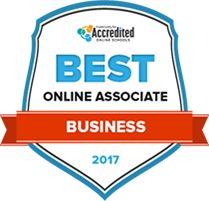 Check out the 2017 top-ranking schools with online associate degrees in business below. A business degree from Edison State Community College gives students the background and experience they need to secure an entry-level position in the business world. Students can complete their associate degree in about two years and can complete the program either on campus or online. A number of transfer options, such as a 2+2 university transfer, are available for students who would like to continue their education with a bachelor’s degree at a four-year institution. Edison State has multiple degree programs and serves more than 3,000 students in 30 different fields. Online students at Edmonds Community College use the Canvas learning management system to access course materials and to communicate with their instructors and peers. The school has been offering eLearning programs since 1993 and provides degree and certificate programs as well as a 2+2 transfer degree in business administration with Washington State University. Edmonds offers 61 associate degree programs and serves 11,100 students per quarter. Nearly half of these students transfers to a four-year institution to pursue a bachelor’s degree. Students services such as a diversity student center, advising and career action center all aim to help ensure students’ success. A business degree from Tulsa Community College is available in a number of formats, including traditional on-campus, blended, online, traditional schedule and fast-track, giving the widest range of students access to a higher education. Students can earn a university transfer degree to earn a bachelor’s degree, a workforce certificate or a traditional associate degree. Students have access to a new student orientation to get them acclimated to the college environment and expectations and an Office of Diversity and Inclusion helps to reinforce the diverse way of life at TCC. A Career Services center has career counselors ready to help students find the right path for them. Students at Columbus State Community College can earn a business degree in a web or blended, hybrid, format. This associate degree is considered online, however some courses may require on-campus clinical or laboratory classes on campus. There are numerous specialization opportunities available, including certificates in business operations analysis, project management, entrepreneurship and foundations of insurance. Columbus State offers career programs in 55 fields and a transfer program for students who want to continue their studies at a four-year institution. It serves about 26,000 students each year. An associate of applied business degree at Cincinnati State teaches students how to solve management issues in real, everyday situations. Students learn cooperatively to improve business results and to make decisions in marketing, human resources and accounting. Cincinnati State also has a wide range of other program offerings including applied technology, health information technology, pastry arts and legal administrative assistant. The school has been offering distance education opportunities since 1995 and has more than 200 online courses as well as several programs that are completely online, including pre-business administration. The Business and Public Services Division at Sinclair College provides associate, certificate and professional credentialing programs in fields like real estate management, web development, accounting and emergency medical services. These programs prepare graduates for both the workforce and for furthering their education at a four-year institution. Qualifying students can participate in the Kappa Beta Delta Honor Society and internships are accessible to many. Specialized learning spaces are available to students, like three computer labs, an indoor electronic shooting range and crime scene rooms for criminal justice students and three hospitality management laboratories. More than 60 programs are available in the BPS Division alone. The Academic Divisions of the East Mississippi Community College offers the associate degree in business administration to enrollees who are planning to attend senior college after taking the program. The program is designed to provide basic principles in business administration and to also teach skills to the students in preparation for their transfer to a higher continuing education. The course credits are transferred easily to most schools within the state. If not, East Mississippi can arrange a new coursework so that the student can meet the needs of the desired institution provided there is an authorization from the advisor or program head. Students at Arizona Western College have a number of options when looking to earn a degree. They can attend classes and earn one of more than 100 degrees and certificates via the internet, telecourse, web conference, interactive television or in a hybrid mode—in addition to traditional on-campus classes at several campuses. An international program ensures that diversity is at the forefront of the school and a variety of clubs and organizations are available for those who want to get involved in student life. And honors program and migrant assistance program are also available to qualifying students. A business degree from Mesa Community College provides the framework that graduates need to develop the skills needed to be marketable in the workforce. Its online programs offer more than 500 courses and 20 degrees and certificates so students can successfully juggle a busy personal and professional life with earning a degree. Students have support from their instructors via the Canvas learning environment and campus library faculty members are available for academic support and to help locate other services students may need, such as tutoring. Ogeechee Technical College has designed its academic programs to help its students graduate ready for the workforce. Students have the benefit of small class sizes and one-on-one instruction as well as free career assessment to help them determine what degree program is best suited to their interests. Options vary widely from welding to business management to medical assisting to education. The school began as a small technical college, then a nursing school and now serves more than 3,000 students in general academic programs, adult education and continuing education. In deciding which business school to attend, students must consider a wide variety of factors and program characteristics. The following search tool allows users to look for schools based on criteria that are important to them. For example, tuition, school type and school size can all be used to narrow down a list of potential online business schools. In order to obtain an online associate degree in business, a prospective student must first apply and get accepted into a program. Once classes begin, it typically takes two years of full-time study to earn the degree. The following section gives pointers on the admissions process and what students can expect during their first and second year of an associate business program, along with steps for graduation or transfer. Students will need to submit proof that they have obtained either a high school diploma or GED. This can be done in several ways, such as submitting a certified copy of the high school diploma, presenting a copy of a high school transcript indicating the student has graduated, providing a copy of the GED certificate or showing a college transcript indicating the student has graduated from high school. Not all programs require these tests and the ones that do may allow certain students, such as adult or nontraditional students, to skip this requirement. Few schools will have minimum scores for admission, but most schools will have a minimum score they’d like incoming students to have. Prospective business majors may be expected to show strength in both math and writing. Some online programs may require prospective students to complete an information interview with an admissions officer in order to answer any questions the student may have and explain the business program in-depth. This helps both the school and the student determine the right match for an associate degree in business. The application for an online associate degree in business will request information such as academic history, high school GPA, work history and the like. Depending on the school, an application fee will also be required. In order to properly place incoming freshmen, some schools will require admitted students to take assessment tests in certain subjects. This will determine if the student needs to take remedial classes before beginning their program. Students will take fundamental business courses during their first year of an associate degree. Subjects will include the basic concepts of marketing, financial accounting, managerial accounting, microeconomics and business mathematics. An associate degree is shorter than a bachelor’s degree, but most curricula will still provide a well-rounded education. In addition to introductory business courses, students will usually take a few general education classes during their first year, such as literature, science or history. Not all incoming associate-level students will have the same level of educational background and experience. Most students will be able to commence work on their degree immediately upon enrollment. However, some students may need to take remedial courses in order to be fully prepared for the business curriculum. Once basic business theories are understood, students will be able to move onto more advanced and complex ideas. Students will learn about business ethics, business law, organizational theory and behavior, human resources and management. General education requirements will continue into the second year. In addition to general education courses of their choice, students will also be able to select a few business-related elective classes to tailor their degree to their academic and professional interests. During their final year, students will hone business-related skills that they are likely to utilize upon graduation or transfer to further education. This includes becoming familiar with business documents and correspondence, as well as becoming proficient in business software such as word processing, spreadsheet and bookkeeping. An online associate degree can stand on its own or serve as a springboard to the bachelor’s degree. Transfer requirements differ among schools and programs, but assuming the basic requirements are met, many four year colleges and universities will allow students with associate degrees to transfer their credits and obtain a bachelor’s degree in two years of full-time study. Maybe it’s a dream school they’ve always wanted to attend, but couldn’t straight out of high school. Maybe it’s a school that excels in a particular program or business concentration. Either way, students should identify the schools they want to transfer to and make sure a transfer will be possible, given their current credits and academic standing from their online associate program. Potential transfer students need to figure out the specific requirements for each school they’re interested in transferring to. These school-specific requirements can include things like standardized test score requirements, the maximum number of credits that can be transferred, minimum GPA and which courses will receive full transfer credit. Many schools will have minimum GPA requirements for their transfer students. Even if these minimum requirements are easily met, a high GPA might help the student to obtain a better financial aid package – and saving money is always going to be worth a little extra time spent hitting the books. Students should begin working on their application as soon as reasonably possible. The application may require standardized test scores, letters of recommendation, an essay and academic transcripts, all of which will take time to gather. Even though many jobs in business require a bachelor's degree, students who graduate with an online associate degree in business have several career paths open to them. Most of these career prospects are entry-level positions within a business setting. For example, graduates with an associate degree can work in accounts receivable as a coordinator, find a job in sales, or move into insurance or real estate. And after gaining some real world experience, graduates can look at moving into managerial roles, such as a casino manager, property manager or office manager. Administrative assistants provide support to other members of an organization by performing clerical and administrative tasks. Job duties often include filing, answering the telephone, maintaining appointment calendars and preparing routine business documents. Administrative assistants can work in a wide range of settings, from government offices to private companies to medical offices. The primary job of an advertising sales agent is to sell advertising to clients. An advertising sales agent will have a variety of tasks to complete, such as finding new clients, explaining to potential clients why they need to advertise, ensuring current clients are happy with the services they purchased and give advice on advertising services. Wholesale and manufacturing sale representatives work to sell goods to other business on behalf of wholesalers and manufacturers. Job tasks range from finding prospective buyers to negotiating the terms of a sale to following up with buyers to ensure customer satisfaction. Wholesale and manufacturing sales representatives must have intimate knowledge about sales, the products they are selling and the underlying businesses they represent. As their job title indicates, property, real estate and community association managers are tasked with managing properties. Management duties include presenting properties to potential buyers or renters, managing cash flow of a rental property or community association, negotiating sale or rental terms with clients and making sure properties they are responsible for are properly maintained and repaired as necessary. Monitoring profitability is a critical task for any business. Therefore, any business associate degree program will teach students the fundamentals of accounting. By the time they graduate, students will understand the different methods of keeping track of assets, cash flows and transactions, as well as how to utilize this information to make business decisions. Many of the potential jobs and careers immediately available to those with an associate degree in business will be entry level sales positions. This means that graduates will learn about how to raise the profile and awareness of their company and product/service being offered. Students will learn theories of how and why people buy what they buy, effective selling strategies and psychological principles that pull in potential clients. The push for increased profits and sales is a strong motivator for businesses to use not-so-ideal strategies and methods. Because businesses have often committed acts they shouldn't have, there are now long lists or rules and regulations to follow. All reputable business associate degree programs will teach its students how to behave in an ethical manner and within the confines of the law. Much of the business world revolves around connections and networking. Individuals with a greater array of contacts are almost always at an advantage. From finding a job to identifying potential sales leads, who you know is at least as important as what you know. The following is a list of resources that those entering the business world are bound to find useful. The AMA allows student members to take advantage of career resources, AMA competitions and opportunities for professional development. The BMA is intended to help those in the business to business marketing field with a wide range of resources, including training, educational materials and local chapters. The BPA is the premier student organization for future business professionals. The BPA has a host of resources designed to help students with careers in business management, information technology and office administration. The DECA's mission is to assist high school and college students with future academic and professional careers in business, leadership and entrepreneurship. The NASP is a professional organization devoted to helping individuals within the sales industry. The role of the NASP is to advance the sales profession and help members network to improve their careers.